In recent years, the term ‘artisanal craft’ has become something of an eye-roller—an overused descriptive for local makers that helped ignite a trend—and in doing so, created a stylized and squeaky-clean image of designers and their honed skills. The craze hasn’t waned, and while more attention to local, small-scale handmade goods can only be a positive, the hype isn’t without its backlash. ‘Artisanal’ is now widely used by many corporate brands and marketeers to describe products they deem authentic and handmade. But do these labels diminish the output of individual skilled artists creating functional products? And in a bid to be niche and socially responsible, shouldn’t we be looking directly to the source? It might not be as curated or as glossy, but then if we wanted that, we could go to Ikea. When it comes to the tactile skill of pottery, two things it is not, are clean and minimal. The very nature of working with clay is dirty, gritty and physically intensive. Results‚ be they simple forms or functional tableware may look easy to achieve, but in fact, they take years of dedicated practice to perfect. 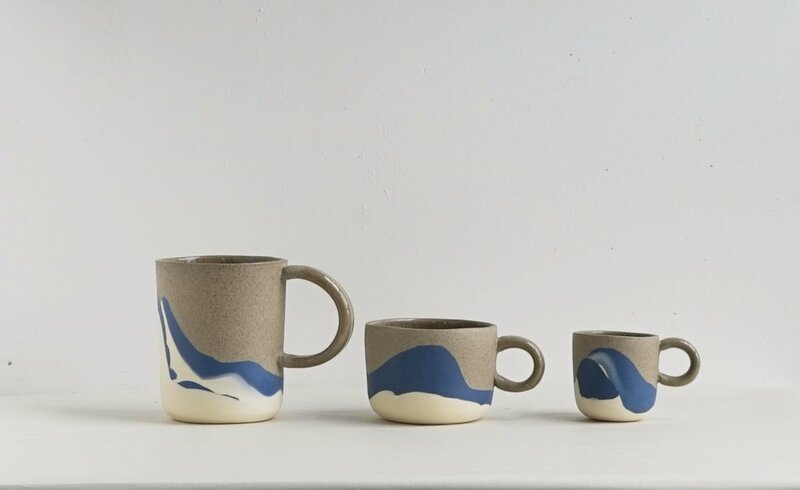 “I really wasn’t aware of the crafts and handmade movement that was happening,” says Brooklyn-based potter Helen Levi. “I studied photography and was focused on a different kind of art experience, namely taking pictures and doing documentary photography. 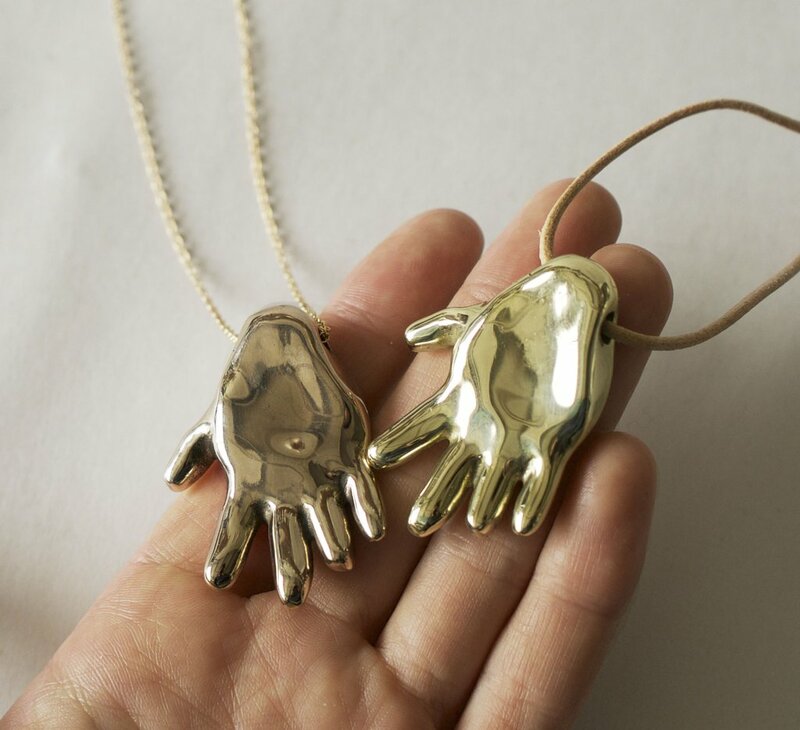 I was totally oblivious to the popularity of the handmade object,” she adds. Born and raised in New York’s East Village, Helen first took pottery classes in elementary school and continued to practice through high school. By the time she reached college, (where she surprisingly didn’t study the craft), she was teaching wheel throwing techniques to students. Prior to starting her own name line, which is now a successful venture comprising of functional pieces from hanging planters, mugs, pitchers and tumblers, Helen continued to teach, this time back at some of the same Manhattan studios where she practiced as a child. "I fire to cone 5/6 which is approximately 2200 degrees Fahrenheit. In my larger kiln the entire firing process takes about 36 hours. I can fit eight tree planters in the big kiln or about 100 small pieces." "I have my brass hole punch which I use to make the hole in the bottoms of planters, some toothpicks which I never think to use but I got at the 99 cent store, and a bowl of wooden tools made for me by my friend Ariele Alasko. One of the best gifts I've ever gotten!" Helen’s work was discovered by the fashion designer and boutique owner, Steven Alan. 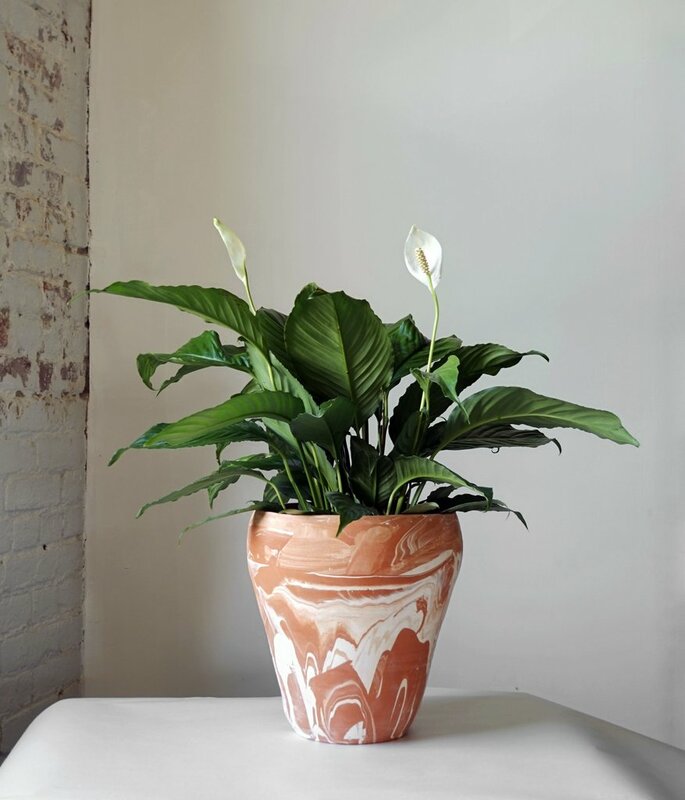 “Helen does pottery,” a friend had recommended, prompting her to consider the potential of her hobby: “I thought no, I don’t really do it—just because I’d never really conceptualized it as that—it was just something I always loved,” says Helen today. He was the first to place an order and the oversized planter piece from that very first selection is still something she makes today. 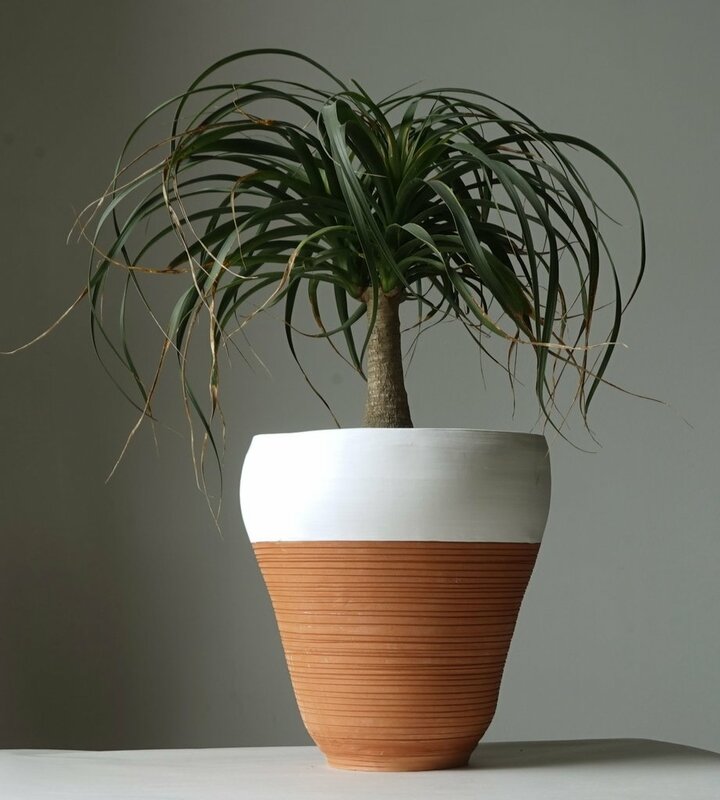 “I’ve been experimenting with terracotta planters. I like them to be big enough to hold a small indoor tree,” she explains. This focus on nature flows through all of Helen’s work and she prefers to make distinctions through the type and color of clay she uses than through elaborate glazing methods. “I get more inspired by colors of material than I do by glaze so I work a lot with tinted clay and marbling for that reason,” she explains. Her collections vary in the waves of colored clay and the chosen styles of objects but all are inspired by the elements. ‘Beach’, ‘Ocean’, ‘Desert’ and ‘Celestial’ are just a few in the Helen Levi series. “I’ve experimented using found materials like dirt in my glazes and I’d say I’m directly inspired by the landscape,” she enthuses. “It’s the source of the most beautiful shapes, textures, and colors…” So much so that a blue/grey-hued tumbler echoed the horizon line at the beach in Islay, Scotland where Helen collaborated on a whisky series with Scotch distillery, Bruichladdich. “That tumbler worked out so beautifully with the water but I didn’t color match it—it just worked out that way. Sometimes you can’t plan it. With pottery there’s a certain attitude you have to adopt of just letting go.” Another happy accident for Helen (although she argues most are not happy, just frustrating) was her celestial glaze that didn’t activate in the way she had planned but now she really loves it. 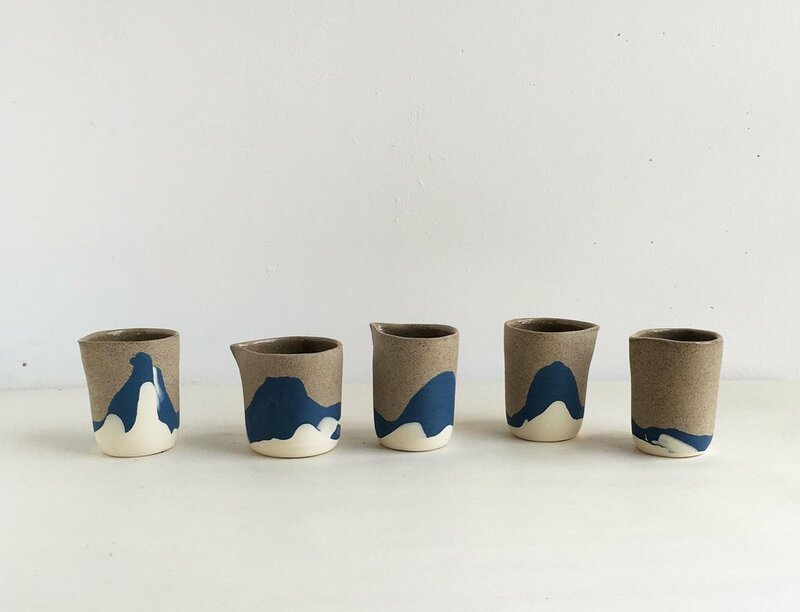 "I made these tumblers during a residency in California last year. Beside them is a tiny blue planter I made, an antique jug I got during a road trip in Colorado, and the teapot I found on the street here in Brooklyn. The dice are a tourist keepsake that belong to my boyfriend." for showing us around Brooklyn and giving us insight into the pieces you create in your Red Hook studio. 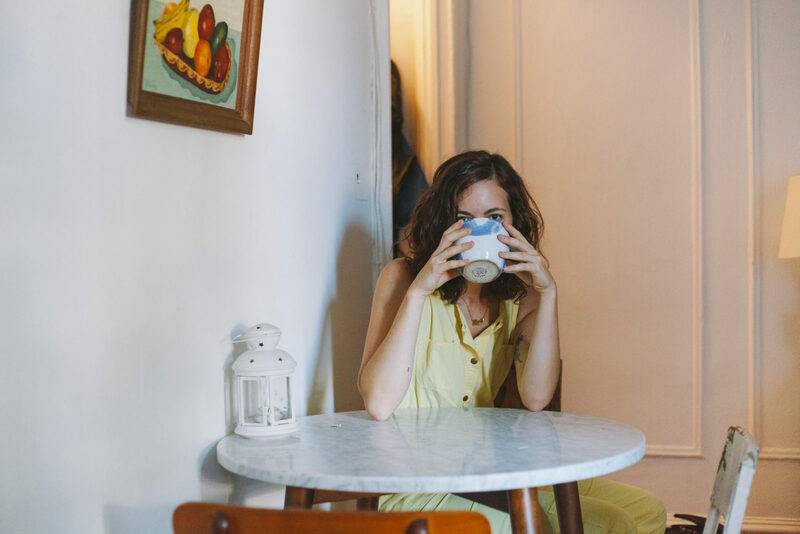 Visit Helen’s website to see more of her work and check out some of our other Brooklyn-based portraits here. This portrait is part of collaboration between Freunde von Freunden and Werde Magazine, founded on our shared appreciation for working creatively with nature. 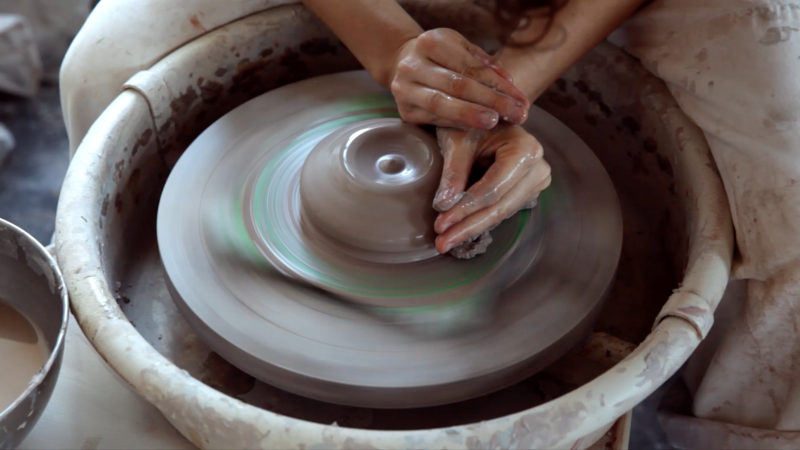 To try your hand at Helen’s technique, head to Werde Magazine where you can find her DIY clay tutorial.